Is the 2-Tone Branding the Best of all Music Genres? If somebody asked you to describe the image of 2-Tone, what would you say? Black and white checks? Pork pie hats? Loafer shoes? Probably all of those things, I would guess. 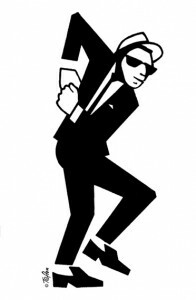 Some of those images come from the iconic Walt Jabsco character ultimately created by John Sims (Teflon), but initiated by the Specials’ ‘General’ Jerry Dammers and bassist Horace Panter. Horace was an art student himself before joining the Specials, but it was Jerry Dammers who had the very clear idea in his mind of what 2-Tone stood for and how it should be represented. Can you think of any other music genre which has an image as instantly recognisable? Read the following blog about how the 2-Tone design was created and why it has lasted the test of time.